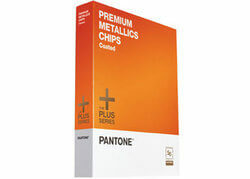 PANTONE Plus Series Premium Metallics Chips (Coated) – 300 shimmering shades to add real sizzle to your design projects! 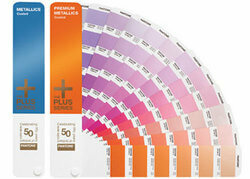 PANTONE Plus Series Premium Metallic Chips (Coated) offer 300 dazzling metallic colours that have been specifically developed to meet the ever-growing demand for and use of special-effect inks. 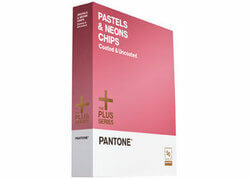 PANTONE Premium Metallic Chips (Coated) are chromatically arranged and printed on coated loose-leaf style pages offering six tear-out chips that are ideal for attaching to artwork and digital files. 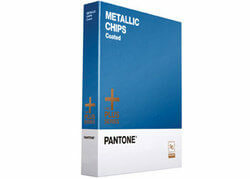 PANTONE Premium Metallic Chips (Coated) offer greater brilliance, can be easily coated without any loss of luster and possess a greater life after printing without tarnishing or discolouration.